We’d love your help. Let us know what’s wrong with this preview of Held in the Light by Anne Morrison Welsh. To ask other readers questions about Held in the Light, please sign up. On November 2, 1965, Norman Morrison, 31-year-old devout Quaker, husband, and father of three, stood outside the Pentagon, poured kerosene over his body, and struck a match. He immolated himself to express his deep concern over the escalating war in Vietnam. Before taking his life in a spectacular way, he mailed his wife a farewell letter of explanation, which included a newspaper clipping about an eyewitness account of the bombing of a Vietnamese village by U.S. warplanes and the resulting deat On November 2, 1965, Norman Morrison, 31-year-old devout Quaker, husband, and father of three, stood outside the Pentagon, poured kerosene over his body, and struck a match. He immolated himself to express his deep concern over the escalating war in Vietnam. Before taking his life in a spectacular way, he mailed his wife a farewell letter of explanation, which included a newspaper clipping about an eyewitness account of the bombing of a Vietnamese village by U.S. warplanes and the resulting deaths of innocent civilians. 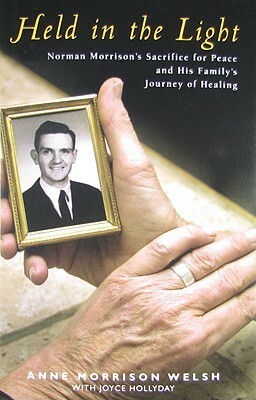 Norman Morrison’s story is told by his widow Anne Morrison Welsh in her 2008 memoir Held in the Light: Norman Morrison's Sacrifice for Peace and His Family's Journey of Healing. Like the act that inspired it, this book is both awful and awesome, haunting and inspiring. What kind of a death was Morrison’s? Was it a senseless act of a deranged man? A beautiful and noble expression of sacrificial love? There’s a fine line between heroism and suicide. If a man jumps into a raging river to save a child and drowns, he is a hero. But what if he jumps in a river to save a dog? Or a rat? What if he jumps in the river to protest water pollution? Is he still a hero? Self immolation is incomprehensible to us Westerners, but not to Easterners. The book quotes a letter to Martin Luther King, Jr. written by the Vietnamese Buddhist monk Thich Nhat Hahn and published a few months before Morrison’s death: “The self-burning of Vietnamese Buddhist Monks in 1963 is somehow difficult for the Western Christian conscience to understand. The press often spoke of suicide, but in essence, it is not. What the monks said in the letters they left before burning themselves aimed only at alarming, at moving the heart of the oppressors, and at calling the attention of the world to the suffering endured then by the Vietnamese. To burn oneself by fire is to prove that what one is saying is of the utmost importance” (58). In another passage the book explains, “For the Vietnamese people, Norman had metaphorically put on the saffron robe of the Buddhist monk and spoken their language. They saw his sacrifice for peace as a great act of love for them. He became a folk hero of sorts, his name rendered in Vietnamese as Mo Ri Xon” (108). A North Vietnamese postage stamp bears his image, and a Hanoi street is named after him. Years after Morrison’s death, many Vietnamese still recall where they were when the heard the news of Morrison’s death. One man had been a buffalo boy in a small, rural village where no one had access to a newspaper and only the headmaster of the school had a radio. The man recounted how “one day, the headmaster called us all together and told us about Morrison. Tears were streaming down his face. Of course, we all cried. I could not believe someone in another country would die for us” (131). It amazes me that an American so well known and beloved in another land can be so little known in his own. I cannot condone what Morrison did, but neither can I condemn him. And I do not pretend to understand. I stand in awe and horror of a man who, as poet David Ferguson said, “spoke in a tongue of flame” (85). I haven't read this book, yet, but I just wanted to remind myself why I have it on my list. I heard an interview of the author on NPR and was intrigued/appalled. This is a book about a man (and obviously, his family) that set himself on fire in protest of things that were going on in the Vietnam war. It sounds horrifying, yet I want to know how his family has dealt with it, and the amazing love that was poured out to their family from people all over the world. Interesting story of Norman Morrison who sacrificed himself for peace in Vietnam. Put a little more light into answering tough questions-some see him as crazy for lighting himself on fire. His wife does a beautiful job showing the reader the truth and both sides of the story. Even if you don't agree with his decision, the book makes you think about the consequences of war. One November afternoon, Norman Morrison drove to the Pentagon with his one-year-daughter, and burned himself to death to protest the Viet Nam War. What happened to his wife and three children afterward?